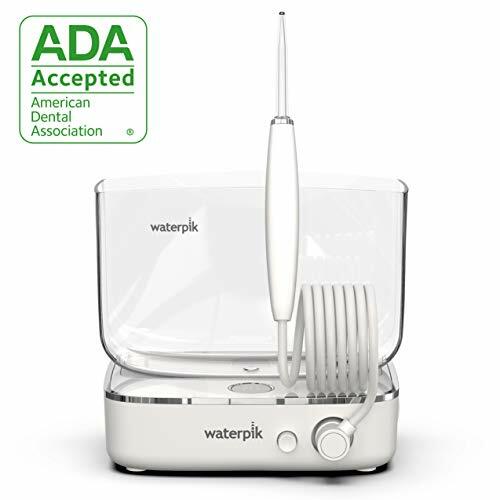 The Waterpik WF-04 Sidekick is a sleek, new countertop water flosser that is designed to be portable enough to take with you while traveling. Normally, if you want to floss when traveling you would have to bring some string floss or a portable, cordless water flosser like the Cordless Professional WP-440 with you. This is usually a compromise since cordless flossers have fewer pressure settings, a smaller water reservoir, and they can be difficult to floss with. With the WF-04 Sidekick, you can get the benefits of both a countertop flosser and the portability of a cordless flosser. If that piques your interest, then continue reading as we go in-depth into the features that this product has to offer. One thing you’ll notice if you’ve used Waterpik products in the past is that it does not come with additional flossing tips. This is because the tip is built into the stylus, meaning you cannot swap out the tip for another one. The first thing we noticed is how beautiful this product looks. The WF-04 Sidekick is something you can display proudly on your countertop, and it looks like it’d fit right in with even in the most high-end, modern bathrooms. Its white and chrome satin finish is done tastefully, helping it to look sleek and elegant instead of the usual bland, sterile look a lot of water flossers have. With measurements of 5.70”x3.90”x4.84” and weighing in at only 1.05lbs (0.478kg), this is quite the compact unit. It can get even smaller. 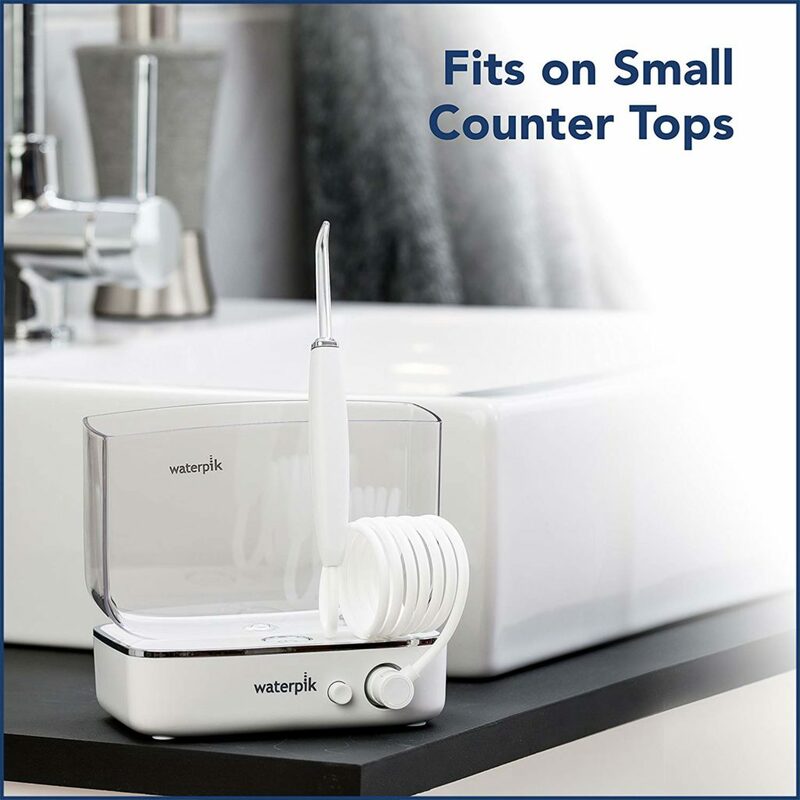 Once you remove the water reservoir, you can actually slide the base unit inside to act like a cap which further reduces its size and makes it truly portable despite being a countertop flosser. Let’s take a look at what each button does on the WF-04. Starting from the top, you can see a big circular power button which obviously turns the device on and off. At the front you can see a hole where the flossing stylus can be attached to, and beside is a small eject button that lets you detach the cord when you are done. Moving on to the right is the pressure slider. Like all other Waterpik countertop flossers, the WF-04 can compete with the other higher end models by outputting water at 10-100 PSI. The dots on the top indicate which pressure setting you are on, with the smallest dot being 10 PSI and the largest being 100 PSI. The slider does not “lock” into each dot, meaning you can actually slide it between dots to have more control of your pressure settings. The water reservoir is capable of holding 13 oz. of water, which can last you 60 seconds of continuous flossing at the highest pressure settings. On a lower pressure setting, you can get additional flossing time (e.g. at around the 3rd dot, we managed to use it for nearly two minutes straight). Unfortunately, we had some issues with the water reservoir. First, it does not have a lid, so dust or other contaminants can potentially get inside. Second, there are no measuring lines. For most people this is not a necessary feature. However, those who wish to administer their oral medication using this unit would have to measure their medication separately before pouring it into the reservoir. If you look beneath the WF-04 Sidekick, here you will discover the charger. It is neatly tucked away and held in place with magnets. Simply connect the power cord to the charger, and connect the other end of the power cord to the back of the device and then connect the charger to the wall. Pretty simple to set up. One issue we’ve had with portable products is their charger. If you are traveling domestically it’s not really an issue. However, if you are traveling internationally, you run into the issue that the power outlets in another country is not compatible with your device. 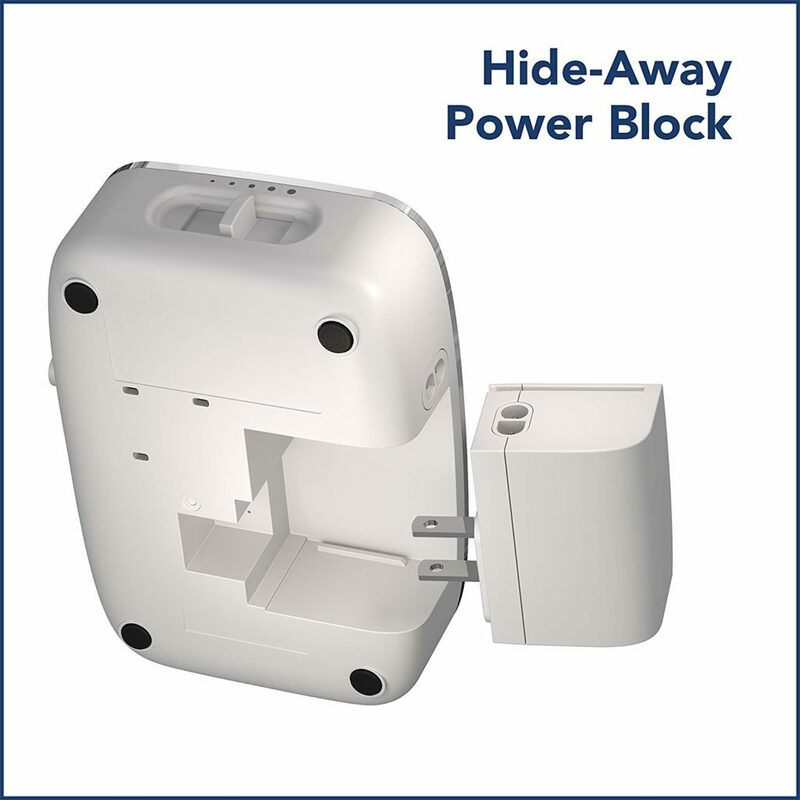 Fortunately, the Waterpik WF-04 Sidekick has a global charger capable of 100 – 240 VAC, 60/50hz which can be used on any outlet. Neat, huh? Let’s examine the flossing stylus. Mentioned above, the tip and stylus are one unit, meaning you cannot remove the tip and replace it with another. This also means you probably won’t be sharing the WF-04 with family members since everyone would be using the same tip. Note: Waterpik now sells extra Sidekick flossing styluses for those who want to replace broken ones or for additional tips that family members can use. The handle is designed in such a way that you can easily swivel it in your hands to adjust the angle of the flosser. 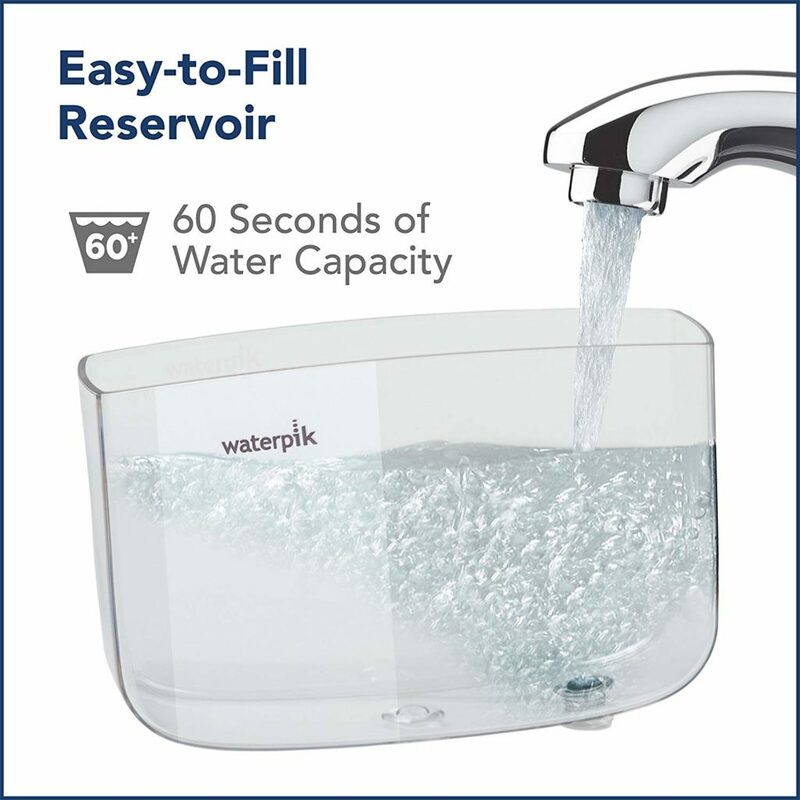 Also there is no pause button which most higher end Waterpik products have. There is a “hook” on the back which lets you clip the stylus on the water reservoir once you’re done with it. The flossing stylus and cord is detachable. You can connect the stylus at the front of the WF-04 Sidekick, and press the button to the left of it to eject it once you are finished. The water reservoir was designed to cover only the base unit; when traveling you have to find some other way to protect the tip since you it is integrated and you cannot simply replace the tip. Lastly, the WF-04 Sidekick comes with its own travel case. Waterpik has truly designed the Sidekick in mind with its collapsible design and useful travel case. When it comes to using any water flosser device, you should always start on the lowest pressure settings and raise the pressure setting as you get used to it. However even before that, we had to set it up. Since each component is detachable, the setup process is slightly longer than other countertop flossers. First, we detached the charger, connected the power cord to it and the base unit, and plugged it into the outlet. Next, we rinsed out the water reservoir, filled it with water and docked it on the base unit. Lastly, we connected the flossing stylus cord to the front, rinsed the tip and placed it in our mouth, and got ready. We made sure the pressure setting was set to the lowest and hit the power button and heard the WF-04 Sidekick roar to life. For most people the WF-04 Sidekick will be adequate for their needs. 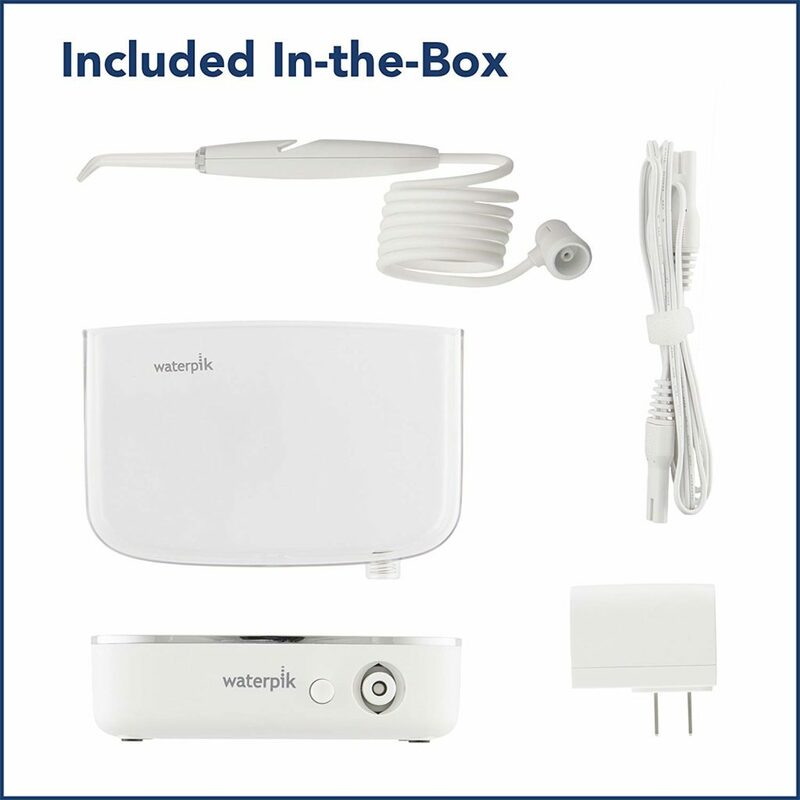 However, the integrated flosser tip is the Classic Jet tip that comes included with all Waterpik products. If you require a specific tip for your needs, you cannot use it with the Sidekick. Also, those who want to administer medication with their flosser will be dismayed to find that there are no measuring lines on the water reservoir. In order to be as compact as possible, the WF-04 Sidekick foregoes a lid for the water reservoir. Unfortunately, some compromises have to be made for the ultra-compact design and the lid was the casualty. This means you have to be extra diligent about cleaning the water reservoir and making sure no dust or water deposit is accumulating on it. You should always try to dry it on a towel with the opening facing downwards to prevent anything from getting inside. We feel that the Waterpik WF-04 Sidekick is an excellent product overall, despite some minor gripes we had with it. This is truly a satisfactory hybrid product that gives you most of the benefits that a countertop water flosser provides like high pressure settings, decent flossing time, and a good handle to floss with. As well, it has the portability that a cordless water flosser has and it takes it a step further with a global charger that can work internationally as well. 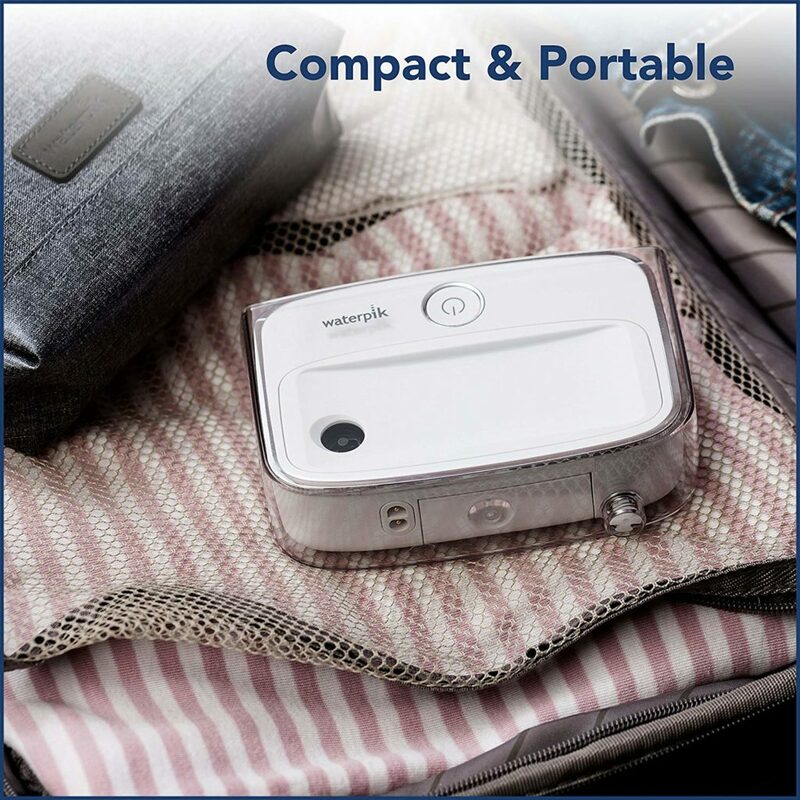 Compared to its predecessor, the WP-300 Traveler, the WF-04 Sidekick is even more compact and offers a comparable level of cleaning for your teeth. 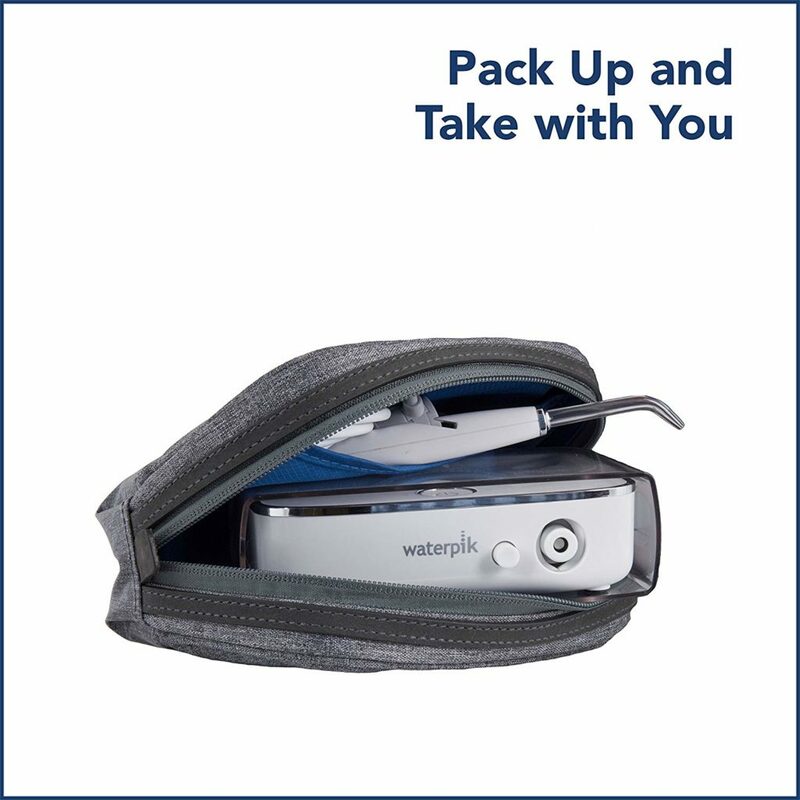 If you can’t live without your countertop flosser while traveling, then the Waterpik WF-04 Sidekick is the perfect product for you.